Welcome To Our New Skateboarding Expert: Lorrie Miller! I am a mother of four, a teacher and writer in Vancouver, BC, Canada. Though I am an avid tame-wild camper, forest-trail runner, and transportation bide-rider, I primarily engage in organized sport at the sidelines, whether it is on the field hockey or soccer pitch, or behind the hay bales of a downhill long boarding race. My son, Wolfgang, has been skateboarding for four years and long boarding for a year and a half. He started racing seriously a year ago, and placed first in two races in his division (grom/junior), most recently on Saltspring Island, BC. His downhill racing has pushed my parental involvement and understanding of the sport into every aspect: gear, safety, regulations and culture, especially now that he has has become a sponsored rider. As a non-skater parent, I have had a serious learning curve, but the racers in our community have been very generous with their suggestions and support. This is one of the many positive aspects of the long board culture. I hope that my insight and experience can help parents new to the sport as they nurture their own kids on wheels. Speed skating helmets feature aerodynamic oval shaped plastic and foam shells and should be worn at all times when skating. A speed skating helmet must come down over the forehead and the back of the head and should fit snugly and securely with the chin strap attached. Skateboarding is a fun, cheap, recreational activity that has become very popular since it first picked up in the early 1960s, with now over 11,592,000 participants as of 2004. If your children want to try skateboarding, send them to the local skate park so that they can practice. As they advance, they can enter skate competitions all over the country. 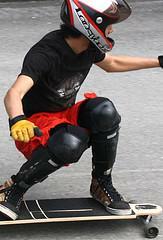 Amateur skateboarding competitions, such as the Free Flow tour, among many others, allow teams to compete and give kids an avenue to go professional and be sponsored. MomsTeam's goal is to provide comprehensive information on skateboarding: advice on the equipment needed and how to buy it, a primer on the rules of the sport, and videos and advice from experts, parents, and manufacturers of skateboarding gear. But to do that we are going to need your help. If you are a parent of a child who skateboards or has skateboarded, we hope you will share what you have learned with other MomsTeam parents. Please consider writing a blog, contributing an article, posting on and/or hosting a Forum, or becoming a skateboarding expert. If you know of someone who used to play or coach skateboarding who has knowledge to share, ask him or her to join. Together we can make MomsTeam a true community of sports parents! Skateboarding is as diverse a sport as the athletes it attracts. Here's advice for beginners from a veteran skateboarding mom.